The beginning of a day in the field: Debbie Thompson's safety glasses reflect (L-R) Sean Robson, me, and Michael Cuggy. I am awoken at 6 am by the pleasant sounds and smells of brewing coffee. I am sharing a room with Norman Aime this week, and I am grateful that he is an early riser, because the coffee is always ready long before I get out of bed at 6:40-ish. By that time, Norm is dressed and has headed out to the front step of the motel with his coffee, where he will chat with Debbie Thompson. Perhaps Debbie will tell him her joke (the long one that we haven’t allowed her to repeat to the rest of us), or they will look to see whether the little brown bat has returned to sleep by the step this morning. Up and showered by 7-ish, and fortified by my first cup of coffee, I run into Ed Dobrzanski in the hallway. Even though Ed retired from the weather office long ago, meteorology is as much a calling as an occupation, and he gives me a thorough and accurate forecast for the day. Today will be warm and slightly cloudy, but at least it will be a bit cooler than yesterday. That afternoon it hit about 32 Celsius, hot enough that we must have each consumed several litres of water on the dry and dusty outcrop. By 7:30 Sean Robson and Michael Cuggy have also emerged, and we are ready for breakfast. Every morning we eat at the Pelican Landing, a short drive across the mist-shrouded bridge over the Saskatchewan River (anywhere in Grand Rapids is just a short drive away!). Over our eggs, bacon, bannock toast, or pancakes, we map out the day ahead. Today, Ed and Norman will scout for new fossil sites north of Grand Rapids, while the rest of us continue to split rock at the William Lake site, a place that has become very familiar over the past several years. The road northward is quiet this morning, even by northern standards: we meet perhaps five cars (most of which are, of course, pickup trucks) in the course of an hour or so. There is little wildlife other than the ubiquitous ravens, but at one point we come across a pair of sandhill cranes searching for their morning snack in the broad ditch. Arriving at the site, we unload the packs, tools, and water pails, and retrieve the shovel and broom that had been safely stowed under a fallen tree. The cooler and water bottles are placed in the shade against the front bumper. Even though it will not be as hot as it was yesterday, the sun’s rays are direct and piercing this morning, and heat is rising from the surface of the rock. Those rays are still at a low enough angle that it would be tempting to put the shadows to use in the search for small and obscure fossils, but right now there is other more pressing work. Yesterday we finished off the bedrock horizon (level) from which we were collecting, and the next uncollected level above is hidden and secret, resting beneath a well-cemented mass of loose rock, gravel, and clay. All four of us work away at this through the morning. First we lift and throw all the larger stone slabs; this is the fun part, because some of them land with a sound like breaking crockery. We follow up with shovels and broom, and finally wash the surface with water. In North Korea, convicts are sentenced to this sort of work. Here, people do it voluntarily, and seem to enjoy it, even though we do complain and swear quite often (field conversation is much less polite than office conversation). Our big advantage is that we are much better fed than those people in North Korea. Speaking of which, it is already lunchtime. Yesterday, Debbie sat on the outcrop in that numbing heat while, I am almost embarrassed to say, the rest of us turned on the truck’s engine and air conditioning. Today is a bit cooler, so we all sit outside on the rocks to eat our sandwiches. Or at least, this is the story I’m telling you here. After lunch, the rock surface we cleaned is now reasonably dry, and we set to with hammers and chisels, splitting the beds apart in our search for fossils. The layer we examined yesterday gave us very few fossils (just one ostracode, as I recall), and today is sadly not much different. I brush the dirt from each slab and turn it in the light, using a hand lens to examine each little feature. On the surfaces I can see salt crystal moulds, algal crusts, or small ripples, indicators of a shallow, hot, salty, and barren environment. There is no evidence of complex life. I hurl the slab onto the growing heap of detritus, then lever out the next piece of bedrock. The toil seems endless and, even worse, completely unrewarding. I remove my hat and wipe the dust, sweat, and sunscreen from my face. The rock we are examining was deposited in the Late Ordovician Period (about 445 million years ago), in an interval during which the sea was becoming progressively shallower. Here in the centre of the ancient continent of Laurentia, conditions were becoming hostile for life as the shrinking sea retreated toward the middle of the Williston Basin (in what is now North Dakota and Saskatchewan). The area we are working in has given us wonderful fossils in previous years: jellyfish, eurypterids (“sea scorpions”), and horseshoe crabs, along with more typical fossils such as corals and brachiopods (lamp shells). But the interval we have reached this year is the “dead zone” of the marine regression, and our attempts to collect fossils here are beginning to depress us. We give up trying to find fossils in these beds, and begin to prepare a block that will be extracted as a lithologic (sediment) sample. We want to get a vertical sample through each interval in its entirety, but the beds are often thin and brittle, so this is a tricky business. I have wrecked several such samples already this week, so I slowly cut out a pedestal of rock. As it is gently tipped away from the bed, Sean straps it with tape. Debbie bags and labels the sample, ready for return to the lab in Winnipeg. As we finish this sample, Norm and Ed drive up to give a report on their scouting progress. They have visited many sites, but most of those have turned out to be full of Silurian stromatolites – algal or bacterial mounds that are of little interest to most of us. Norm is almost always positive and enthusiastic, regardless of conditions, and why should stromatolites be any different? 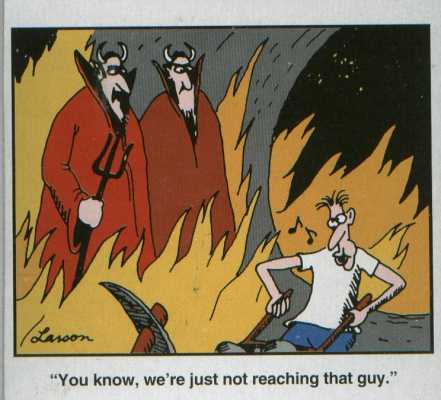 He often reminds us of the whistling guy in this Far Side cartoon. Ed and Norm head off to look at a few more sites, while the rest of us get onto some serious fossil collecting. We are tired of shifting masses of unfossiliferous rock, so we move to a lower interval, one that we already know to contain some wonderful fossils. The fossils are still rare here, and it takes a while to find them, but every few minutes a hopeful sound emanates from one or another of us. After an hour or so, Michael has found some nice arthropod bits. This makes him much happier. Michael is an expert on eurypterids and other ancient arthropods, and he is with us because he needs more material for a proper description of the eurypterids from this site. As it turns out, we will not find many useful examples this week, but we will collect one that will show the entire segmentation of their jointed bodies. So Michael’s time is not wasted. Sean and Debbie have collected some very fine jellyfish, and we have also seen and set aside many odd bits that will only be identified once they have been carefully washed at the museum. Sean is hoping to find some well-preserved linguloid brachiopods (lamp shells). His quest will not be as successful as Michael’s: we can find thousands of brachiopods, but none of them are sufficiently complete for the sort of detailed work that Sean wants to carry out. Several fossil jellyfish are exposed on a bedding plane surface. Now the mood is far more cheerful and relaxed; sometimes the human dynamic in the field reminds me of a sports team. When we are not finding fossils (i.e., losing), then nothing seems to work and every action seems like an effort, but when we find fossils we are completely cheerful and positive. Though some of us do still grumble about the pain in our knees, of course. Poorly preserved linguloid brachiopods are incredibly abundant in some intervals. The sun is getting low. The shadows make for fine fossil-finding, but they are also a reminder that we really should pack it in for the day. This decision is made slightly easier by the fact that the slight breath of wind has diminished, and the blackflies have decided to make plain their painful presence. Reluctantly, we begin to label our “catch,” then pad it into bins in the back of the Explorer. The fossil surfaces are easily damaged, so every piece must be protected before it is transported. The gear is re-stowed, the shovel and broom are hidden, and we pile into the vehicle and ease back to the road. In the golden light, the east-pointing tree shadows are at right angles to the north-south line of asphalt, creating what Dave Rudkin sometimes calls a “bar code road.” We miss Dave this year; we could really use his good humour and his fossil-finding skills, but he has been too busy with other matters. Next year, perhaps? We drive back past rocky outcrops on the gently undulating crest of the uplands, past the trees blackened by last year’s forest fire, past the huge beaver lodge in Eating Point Creek, past the remarkably unspoiled lakes. We reach the curves that herald the approach of Grand Rapids, then coast down the gentle slope and into town. Grand Rapids is small, but it always feels as though it is really “somewhere” when you realize that it takes the better part of two hours to drive to the next place, either northward or southward. There are more dinner choices this year, as a Chinese restaurant has opened right across the road from our motel. After a quick wash, it is very pleasant to walk there through the gathering dusk. There are still rocks to be unloaded from the truck after dinner, and field notes to be completed, but there is relaxation time too. Time to consider what tomorrow might bring, and what unknown fossils may remain hidden somewhere in the immense and enigmatic uplands.